Using his artistic design flair ,and the experience of a specialist company. Dirk Bikkemberg has designed a football boot to help young fooballers on their way. “I didn’t want to follow the current futuristic trend,but asked myself a simple question: What does a kid need to play football? 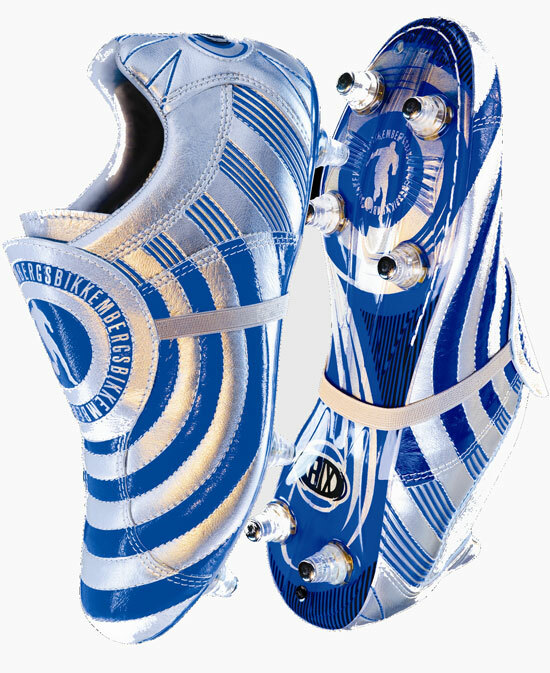 Two fundamental things, studs that allow agility on the field and a football boot that covers the foot like a glove. I made some stylistic refreshments and did some psychological gymnastics and created a modern reinterpretation of the best of the beginnings of the sport”, explains the Belgian designer. His boots though ‘deluxe’, are back to basics, no futuristic forms or hi-tech materials, just kangaroo skin and exquisite handiwork. On sale for a year at a time ‘Bix’ the name for these football boots, can be purchased in either silver and blue or silver and red. Made in Italy, they come with a transparent sole bearing the “pupino” logo of Bikkembergs Sport and the front part of the upper with the distinctive circles, ‘a symbol of energy and power’, that characterises the kit of Dirk’s team, FC Fossombrone. “This is my homage to my team, which we used to test the football boot throughout the twelve months of work required to produce it. But for me, this project is also a challenge and a ticket to make my entrance on the actual field of play. I want to show the kids that my interest in the sport is real and I wanted to make something they can really use”. Not something I would wear, but as they say each to there own, some one will wear them. They look like a more colorful F50.